Log onto the System with your own SA3000 home Pager. 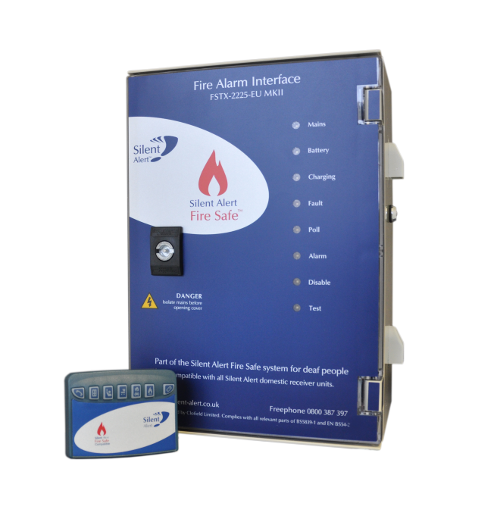 The unique Fire Safe system bridges the gap between high cost on-site paging systems and paging systems used by people who are deaf at home. Silent Alert receivers supplied as part of the market leading Silent Alert SA3000 Home Paging System have a unique feature that allows the user access to fire alarms in all public buildings where the Fire Safe System is installed. When entering a building where the Fire Safe notice is displayed, the user simply presses the fire symbol on their pager keypad. The pager will vibrate three times to confirm that fire safe cover has been activated. If the fire alarm sounds whilst the user is within the building they will be alerted automatically. At last people who are deaf can have unhindered access to fire alarms systems in public buildings using their own home pager unit. An individual can take full responsibility for his or her own fire safety without the need to ask a stranger at reception for a pager. The pager can be handed out to deaf or hard of heard visitors from reception. Alternativly visitors already using the Silent Alert system can bring their pager from home. The SignWave can be placed in a hotel room to provide the suggested overnight cover detailed in BS5839 via the optional vibrating pillow pad.